Tzimtzum (also spelled tsimtsum) is the idea, according to kabbalah, in which God pulled back in order to make room for creation. The Ari (famous kabbalist Isaac Luria 1534 -1572) described an initial, pre-creation state of infinite light, within which there was no place for anything else to exist. Before creating any worlds, the Creator first had to withdraw His essence completely, resulting in a total void within the infinite light, so that the process of creation could begin. 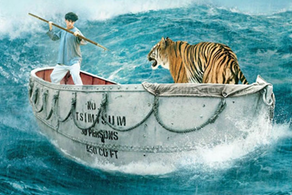 TsimTsum is the name of the Japanese freighter that an Indian family boards on their way to a new life in Canada in "Life of Pi." The Bible's second verse speaks of this, when the earth was without form, and void, and darkness was on the face of the waters. The Hebrew word for 'without form' is tohu, which literally means chaos. One more step was necessary, though, before the creation of the lower worlds could proceed. The prospect that these lower worlds would receive a continuous supply of divine light ran counter to another goal of Creation, which was that man should have free will. As the Ari explains "were God’s infinite light always manifest, man would not have free will". If a person were always aware of God’s presence, transgressing His will would be impossible. God therefore concealed His light, and in so doing allowed man to choose freely between doing good and doing evil. To this end, God formed ten sefirot to act as channels or filters to convey light. The sefirot are ten attributes through which God manifests Himself. The sefirot are not God, but they are the medium through which specific qualities and attributes can be ascribed to Him. These ten sefirot were necessary tools in His plan, for without them, God’s infinite light would have overwhelmed and obliterated worlds and creatures that were placed at lower levels of holiness and spirituality. God designed the original ten sefirot with a built-in flaw; the original sefirah-vessels were created as separate entities that were incapable of giving support to one another. Each of them manifested itself in its purest form - chesed was pure chesed without any admixture of gevurah, gevurah was pure gevurah without any admixture of chesed and so on. When He shone His light into these vessels, the vessels could not bear the intensity of that influx, and shattered. After the shattering of the vessels, God “redesigned” the sefirot so that the vessels would not be overwhelmed by the light, but would be able to contain and filter the light down to our world. The sparks of holiness from the shattered vessels were strewn throughout our world. Some of the shards were thrown far afield and formed kelipot (forces of evil), giving rise to an outside realm in which God’s presence is almost totally hidden. Man has been placed into this realm in which darkness and evil prevail, enabling man to have free choice in his life. One of man’s spiritual missions is to gather up those holy sparks from wherever they may be and elevate them to their original level. We accomplish this mission by means of Torah study, prayer and the performance of good deeds. 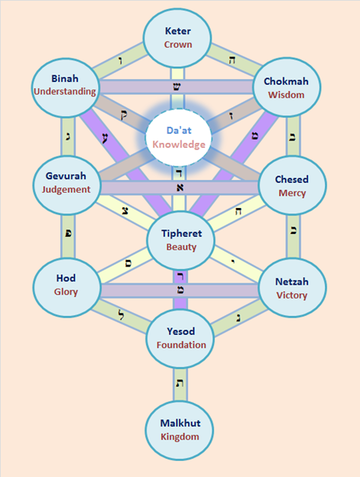 The re-design of the ten sefirot into an organized structure. Isaac Luria teaches that there are 288 fallen sparks. This is derived from the line in Genesis 1:2, "and the Spirit of God moved upon (merachefet) the face of the waters." The Hebrew word merachefet, or "moved upon" (מרחפת) is the eighteenth word in the Torah, and with a gematria value of 728 is the first word that's a multiple of 26, which is the gematria value of the Tetragrammaton (יהוה). The Ari explains that the word "merachefet" is actually a compound of two words: "met" and "rachaph" - the first and last letters - מ ת - spell met ("death"); the remaining letters - ר ח פ -spell rachaph ("move") which has a gematria value of 288. This is also the value of the word ibbur (ע י ב ו ר) which means "gestation". So, death and rebirth are all represented in the opening to Genesis, signifying that 288 fragments ("rachaph") had died ("met") - an allusion to the shattering of the vessels of tohu into 288 initial sparks. 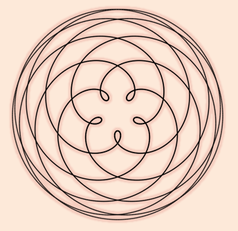 The orbital path of Venus as we see it from Earth (geocentric) traces a spirograph pattern that takes 8 years to complete. One orbit around the sun takes the Earth 365.2 days, and Venus 224.7 days. This gives a ratio of 13 to 8, two consecutive Fibonacci numbers whose division gives an approximation of the golden ratio. The difference between 13 and 8 explains the five-fold symmetry of the geocentric orbit of Venus. 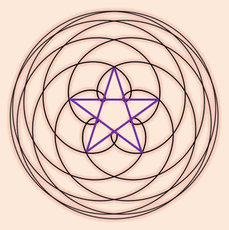 This pattern is sometimes called the Rose of Venus, and a perfect pentagram can be superimposed at its center. The dance of the planets to the music of the spheres. Beauty abounds! The planet Venus forms a pentagram in the night sky every eight years, returning to its original point every 40 years with a 40 day regression. Pentagram comes from the Greek word pentagrammon, meaning five lines. It was an important symbol to the Pythagoreans, and the angles formed by the five lines mirror the numbers from the Pythagorean triangle above. The line segments are proportionate to the golden ratio. 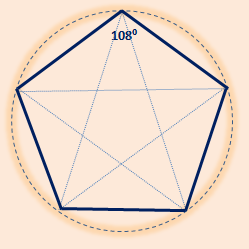 A pentagon is traced around a regular pentagram. Each internal angle of the pentagon is 108 degrees. 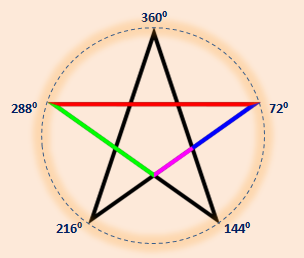 A regular pentagram colored to distinguish its line segments of different lengths. The four lengths are in golden ratio to one another. 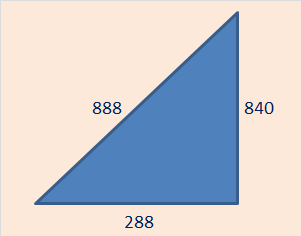 Still on the Pythagorean connection, there is another series of triangles featuring number 288. This series also has the number 153 (fishes) and the aptly named vesica piscis. 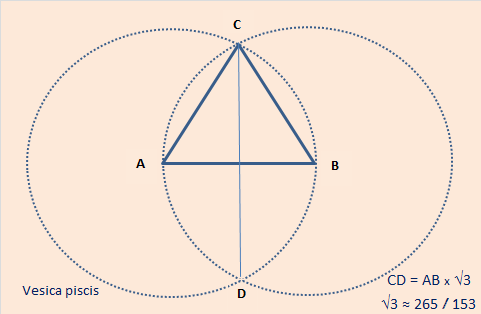 The term "vesica piscis," meaning "fish bladder" in Latin, is used for the particular symmetric lens formed by the intersection of two equal circles whose centers are offset by a distance equal to the circle radii. The proportions of this lens is given as 1:√3 or approximately 153:265 (no better approximation can be obtained with smaller whole numbers). The basic shape of the vesica piscis has been adapted as a Christian symbol, called the Ichthys, from the common Greek word for fish (ιχθυος). Augustine in his Civitate Dei, notes that the generating sentence "Ίησοῦς Χριστός Θεοῦ Υἱός Σωτήρ" has 27 letters. "The LORD is gracious and full of compassion;" (חנון ורחום יהוה) has a gematria value of 400. The sefirah (the plural is sefirot) associated with grace, compassion and mercy is Chesed. Its companion, Gevurah is associated with stern judgement. Their combined gematria values total 288! It is interesting that when Jesus instigated the catch of 153 fish, he instructed that the catch should be from the right side of the boat (indicating Chesed, or the right arm of God). The above three Pythagorean triangles, which provided the Vesica Piscis dimensions, are also instrumental in revealing another gematria number which has long puzzled readers of the Bible. 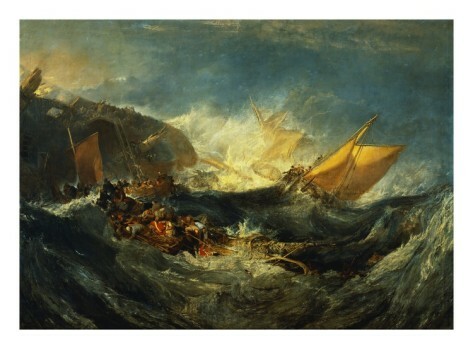 In the Book of Acts, Chapter 27, Paul the Apostle is involved in a shipwreck off the coast of Malta. All 276 persons on board were ultimately saved. As is the case with 153 (fish) and 666 (the beast's number), the precise number referred to immediately attracts attention. 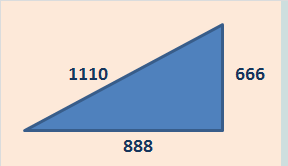 To add to the intrigue 153, 276 and 666 are all triangular numbers. 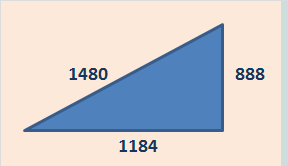 The elements of this exercise are the hypotenuse lengths of the above three triangles (√153, √265 and √288). 210 is a significant Bible number, being the years of the Israelites' sojourn in Egypt. Thus, when Jacob tells his sons to "get you down" (this phrase in Hebrew רדו has a gematria value of 210) and purchase grain in Egypt to stave off the famine (Gen. 42:2), this is interpreted to mean that Israel's sojourn there will last 210 years (timeline here). 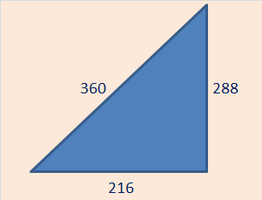 The numbers 210 and 276 are both triangular. Interestingly, both numbers also have further geometric significance: 210 is the 12th pentagonal number, whilst 276 is the 11th centered pentagonal number. A fractal is an object or quantity that displays a pattern of self-similarity on all scales. The term ‘fractal’ was originally coined by Benoît Mandelbrot in 1975, from the Latin fractus which means fractured or broken. Fractals are interesting because as you zoom in closer, the pattern is just as beautiful and complex as when you start. They are both very simple and infinitely complex at the same time. Many scientists believe that they may be useful as a way of predicting apparently unpredictable or random things. A fractal constructed from a pentagon is called a pentaflake. A regular pentagon can be constructed using a compass and straightedge. This process was described by Euclid in his Elements circa 300 BC. Note the vesica piscis at Steps 3-4. A fractal with 5-fold symmetry. As illustrated above, five pentagons can be arranged around an identical pentagon to form the first iteration of the pentaflake. This cluster of six pentagons has the shape of a pentagon with five triangular wedges removed. This construction was first noticed by Albrecht Dürer. "People see God every day, they just don't recognize him." Pearl Bailey 1918-1990. In Hebrew, God (אלהים Elohim) and nature (הטבע teva) each have a gematria value of 86.